You are currently browsing articles tagged Da Nang. Gunnery Seargent Carlos Hathcock, pictured here, zeroes in on one of his 93 confirmed kills. When retired Marine Corps Gunnery Sergeant Carlos Hathcock II died at the age of 57 on Feb. 26, 1999, his legend had long since chiseled its way into the pantheon of Marine Corps history. The medical term for that stealthy, relentless force is multiple sclerosis, a slow, progressive terminal malady that attacks the central nervous system. MS can cause paralysis, spasms and the loss of coordination and muscle control. His disease was diagnosed in summer 1975 by doctors at the U.S. Naval Hospital at Portsmouth, Va. It took 24 years to finally bring him down. During his time as a sniper, GySgt Hathcock was noted for his precision, absolute coolness, patience and endurance. For 93 of his kills he had witnesses —a requirement for the kills to be considered“confirmed.” Although he never kept a ledger, Hathcock once guessed that he’d taken out upward of 300 enemy personnel during his time in the Vietnam bush. 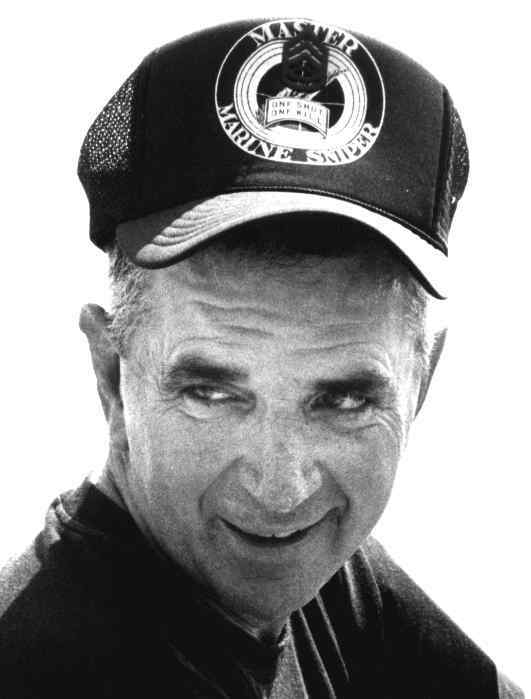 Retired Marine Corps Major Jim Land was Hathcock’s boss in Vietnam in 1966 and 1967, and earlier, the two were on the Marine Corps rifle marksmanship team. They remained friends until Hathcock’s death and burial near his home in Virginia Beach, Va.
A representative of a local Native American tribe was invited to Hathcock’s funeral, and he presented eagle feathers to Hathcock’s wife, Jo; his son, Carlos III; and Hathcock’s shooting buddy, Jim Land. The Indians respected this lone warrior, who was part Indian. Hathcock’s funeral was an emotional moment for Land, who’d often worried about his friend spending too much time in the jungles on missions. Nevertheless, Land smiled when he recalled the time he restricted Hathcock to his quarters. The year was 1966, and Hathcock was under his command at an outpost near Da Nang. Carlos Hathcock with his .50 caliber Browning rifle. His longest confirmed kill was 2500 yards. “The only difficulty I had with Carlos was that he’d stay out there too long. He went on about five [operations] one time before I could get a fix on him. I told a gunny, ‘Bring [him] back here.’ Well, he did, and [Hathcock] looked like a scarecrow,” Land said. Hathcock was about 5 feet 10 inches tall and normally weighed about 160 pounds. After he came back from an extended time on patrol where he subsisted on little more than peanut butter, crackers and whatever he could gather from nature, Hathcock weighed about 120 pounds, Land recalled. “I said, ‘What you been eating out there?’ and he said, ‘I’m doing all right. I’m eating enough to keep the buzzards off my back.’ I told him no self-respecting buzzard would want him,” Land said with a chuckle. But the smile faded, like so many of the memories of Vietnam. Hathcock, however, remains clearly, indelibly imprinted on his mind. “Carlos just really believed in what he was doing out there. He was saving Marines; that’s how he really saw it. He was just doing his job, his duty. Now, Carlos is kind of a folk hero to a tremendous number of people,” he said. Long after the Vietnam War ended, a reporter asked Hathcock if he had been a “trophy collector,” shooting for sport while on the job. It was an insult, and Hathcock fired back at the reporter quickly and accurately. He did not waste bullets or words. Hathcock was born in Little Rock, Ark. His parents divorced when he was just a youngster, so he lived with his grandmother. He began hunting in the thick woods near his grandmother’s house. 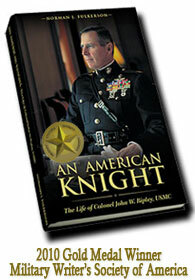 He was self-taught, like World War I legend Sergeant Alvin York and World War II hero Audie Murphy. All the men were experts with a rifle and were also good-natured, hard-working rural boys. Then Cpl. Carlos Hathcock (far left) being awarded the 1965 Wimbledon Cup. This trophy is given to the winner of the 1000 yard shooting match. He was the original laconic, cool-headed country boy. When put to the big-city test, he broke records. In those days, the Marine Corps wouldn’t take anyone under 17. So, on his 17th birthday in 1959, Hathcock enlisted. During recruit training in San Diego, he immediately qualified as an expert with the M1 rifle, a .30-06 that was used widely by Marines and Army soldiers during WW II. It was a heavy rifle, and he could hit the 18-inch-diameter bull’s-eye from 500 yards at the rifle range time after time. He developed a complete fascination with developing the skill and precision of long-range shooting with high-powered rifles. That fascination stayed with him the rest of his life. Initially, he went to Vietnam as a military policeman, but wound up volunteering for combat. It didn’t take Hathcock long to realize that he would be killed with some of his fellow Marines who did not have the woodsman skills and instincts he had developed. He wanted to go it alone. In his first few years in the Corps, Hathcock broke just about every shooting record and received many awards including the 1965 Wimbledon Cup, the U.S. Long-Range High-Power Championship. Maj. Land needed that type of person as an instructor for a sniper school he started in Vietnam for the First Marine Division. Before he was stricken with MS, Hathcock was unmatched in his ability to endure physical and mental hardships to position himself for a kill. With the slow, deliberate moves of a panther in the night, Hathcock would stalk his targets sometimes for days and inches at a time. He felt that a good sniper needed seven characteristics to get the job done and get back to base alive. According to the list, a sniper must be an excellent marksman, a good woodsman, emotionally stable so as not to be easily excited, smart and keenly observant, aware of his surroundings, good with a map and compass and patient. “It takes an awareness of the environment and total concentration at the moment you fire the shot. You have to be aware of the wind, which has a tremendous impact at 1,000 yards; you have to be aware of the sun, whether it goes behind a cloud or not. Then, at the last millisecond, if you will, you have to develop total concentration. It takes a tremendous amount of discipline,” Land said. 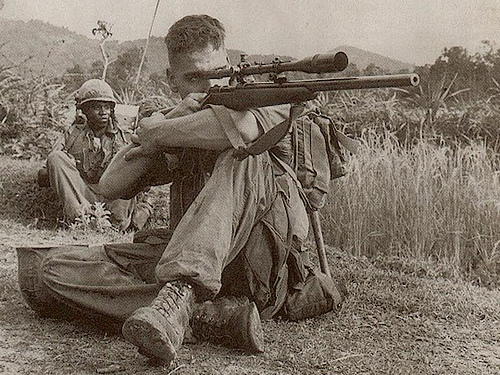 He noted that while most other Marine snipers were proficient or above average in their skills, Hathcock’s uncanny abilities took him to another level entirely. Master Marine Sniper with his trademark smile. Often, Land said, a sniper would have to sit for long periods totally still and silent. If the enemy was near, any movement could mean instant death. “A lot of times you would be sitting so long in one place you either urinated or defecated in your trousers,” he said. The bush could be very unpleasant after several days of no bathing, getting bitten by ants and mosquitoes, going without food and water, the basics. Once, while on a mission, Hathcock came face to face with a deadly snake. But because the Viet Cong were close by, he could not move. He had to stare at the snake and pray. After several tense minutes, the snake flicked its tongue and slithered into the underbrush. After Hathcock had killed a significant number of enemy personnel, the Viet Cong gave him the name “Long Tr’ang,” which means “white feather.” It was because Hathcock wore a white feather in his hat when he was on patrol as a member of Land’s sniper detachment. He traveled light, normally carrying a bandoleer with 84 cartridges, two canteens, a combat knife, a .45-caliber pistol, compass, map and several cans of basic rations. And he carried one thought in his head: Take down the enemy. 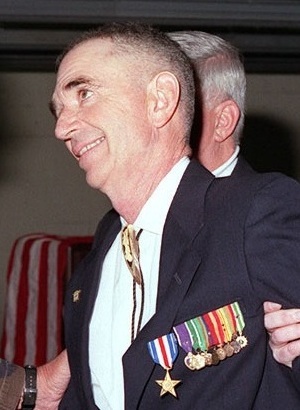 Land said he and Hathcock both had the dubious distinction of an enemy bounty being placed on their heads by the Viet Cong. Anyone who killed either of them would be paid three years salary. It amounted to about $1,000 U.S., and that was a lot of money for Vietnam, he said. Marine Sniper by Charles Henderson narrates the spine tingling feats of Carlos Hathcock. 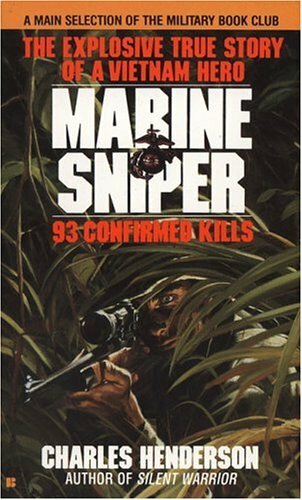 According to the book “Marine Sniper,” written by retired Marine Chief Warrant Officer Charles Henderson, during Hathcock’s service as a sniper, he took down many targets with incredible precision and an unrelenting, cool calculation. Once he put a round through a Viet Cong’s sniper scope while the two men were looking at each other, several hundred yards apart. The bullet went through the enemy’s scope and into the sniper’s head. Hathcock also killed a female Viet Cong sniper called “Apache Woman.” She delighted in torturing and slowly killing young Marines wounded in ambush or in traps set for them in the jungle, Henderson wrote. Land confirmed those stories. “Gunny” Hathcock also shot a Chinese army officer out of a small canoe like boat from a range of about 300 yards. The officer drowned in the river. Land said it was a telling point about Hathcock that he didn’t even mention it in his debriefing session after the mission was completed. Hathcock took no pleasure in killing. He recounted meticulously the details of his mission until getting to the point of seeing the large red star, a Chinese army emblem, and then casually mumbled that he shot the target. “I said, ‘No joke, Carlos? You shot a Chinese officer?’ He said, ‘I don’t tell no lies,’ ” Land said. Probably his most daring and important active-duty mission was when Hathcock shot and killed a North Vietnamese Army general from a range of about 700 yards. Hathcock literally spent days crawling, inches at a time, to get within range of the general’s command post. A magazine article by Green Beret veteran Charles W. Sasser details that event. Hathcock finally took the shot in an open field, vulnerable to the enemy amassed at the compound. “When the general came outside with his aide to get into the car, Hathcock pulled his bubble around him so that nothing could disturb his concentration. He no longer felt hunger or thirst or weariness. The general came out onto the little porch. He yawned and stretched in the morning sunlight. Hathcock lowered his cross hairs to the officer’s heart. He was squeezing the trigger when the general’s aide stepped in front of him,” Sasser wrote. After hurrying for the cover of the jungle, it took Hathcock about an hour to meet his getaway helicopter that flew him out of harm’s way. Hathcock was never hit by an enemy bullet. The closest he came to being killed was when he was in an armored personnel carrier that struck a mine in the Quang Tri Province of Vietnam. Hathcock pulled several Marines from the burning APC, although he, too, was terribly burned from the blast of the large mine. Suffering from second- and third-degree burns over more than 40 percent of his body, he spent months recovering at the Brooke Army Medical Center in San Antonio. He had more than a dozen skin grafts. He was injured so badly that his sniper days were at an end. Gunnery Sgt. Carlos Hathcock after receiving the Silver Star during a ceremony at the Weapons Training Battalion. Standing next to him is his son, Staff Sgt. Carlos Hathcock, Jr.
Those who witnessed his brave and selfless actions wanted to see him receive a top medal, but the quiet, unassuming Hathcock didn’t want one. Stricken with MS and wheelchair bound, he was awarded the Silver Star 30 years later on Nov. 12, 1996, by the Commanding General, Marine Corps Combat Development Command, Lieutenant General Paul K. Van Riper. 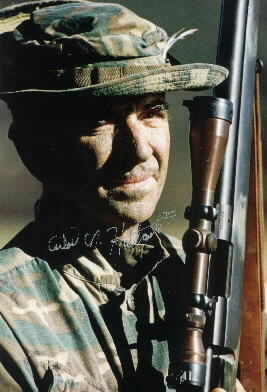 Not long after recovering from his burns, Hathcock received orders to help establish the scout and sniper school at Marine Corps Base Quantico, Va.
On April 20, 1979, MS forced Hathcock to retire, just a few months shy of 20 years on active duty. He taught classes right up to the day of his retirement. Land and others worked with Headquarters, U.S. Marine Corps to make sure Hathcock retired with full benefits. Editor’s note: John Flores, a former search-and-rescue crewman serving four years active duty in the U.S. Coast Guard, is a self-employed journalist in Albuquerque,N.M. Last fall he received the Department of the Navy’s Meritorious Public Service Award from the Marine Corps Commandant, General James T. Conway. Flores is writing a biography for Texas Tech University Press about Sgt. Freddy Gonzalez, a Medal of Honor Marine killed during the 1968 Tet Offensive. This article is re-printed by courtesy of the Marine Corps Gazette and copyright is retained by the Marine Corps Gazette.